See more objects with the tag dining, seating, chairs, affordable, mass market, innovative, mid-century modern. This is a Drawing. It is dated 1955 and we acquired it in 2002. Its medium is brush and blue watercolor on pre-printed white wove paper. It is a part of the Drawings, Prints, and Graphic Design department. The Danish furniture and interior designer Finn Juhl, with Klaare Klint and Arne Jacobson, made Denmark a leader in modern home furnishings in the 1940s and 1950s. Juhl, in particular, led the fashion for Danish modern domestic furniture in the American market during the 1950s and 1960s. 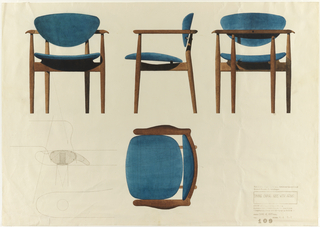 Design for a Dining Chair (1955), manufactured by Baker Furniture Incorporated, represents Juhl’s forms as tailored for American mass production. Drawings for mid-century furnishings by major designers are among the objects currently targeted for acquisition. At the time of proposed acquisition, drawings of 1950s design have been limited to a handful of radio, vacuum cleaner, and sewing machine designs by Richard Arbib; advertising designs for W. J. Sloane & Company by Max Walter; and one interior design by the French designer Mathieu Matégot. This Juhl drawing, together with Design for a Dining Chair with Arms, will help document the importance of Danish design in postwar America. These drawings also represent another step in the evolution of 20th-century furniture design away from the metal and upholstered wood furniture of the 1920s and 1930s, represented in the collection by the Donald Deskey archive and two Gunnar Asplund chair drawings. 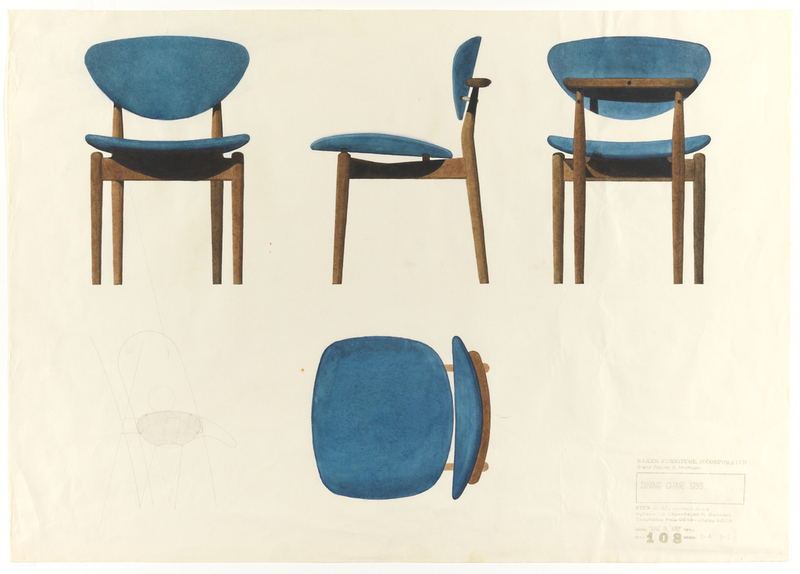 Just as Deskey’s European-inspired modernist furniture designs were created for mass production by American furniture manufacturers, the Juhl drawings record the construction, production, and adaptation of European design to American mass market. This object was featured in our Object of the Day series in a post titled A Chair for the American Family. This object was fund: General Acquisitions Endowment: Drawings, Prints, and Graphic Design Department Deaccession Fund. It is credited Museum purchase through gift of George A. Hearn.